Our guests can expect seven restaurants, a spa and beautiful rooms at the elegant, all-inclusive, beachfront Paradisus Cancun - All Inclusive. The resort has five mid-rise pyramids, reminiscent of Mayan architecture, housing 678 rooms. All accommodations have private terraces with ocean or lagoon views, minibars, coffeemakers, in-room safes, clock radios and flat-panel TVs with cable and pay movies. Non-smoking rooms may be requested, and high-speed internet is available for an additional fee. Active leisure options include a fitness center, a nine-hole golf course, a tennis court and water sports like kayaking, windsurfing and snorkeling. Choices for a quieter day include massages and treatments at the spa, Tai-Chi classes or relaxing on the beach. The hotel offers seven restaurants, theme dinners, several bars or lounges and a snack bar. Amenities include a business center and a concierge desk. Across the street from the Aqua World marina, Paradisus Cancun is four miles from the upscale shops and restaurants at Kukulkan Plaza. Downtown Cancun, the Chichen-Itza Archaeological Museum and Cancun's Aquarium, where guests can swim with dolphins, are within a half-hour drive. The concierge desk can arrange tours to Isla Mujeres, Xcaret Ecological Park and the Mayan Ruins at Tulum and Chichen Itza. Cancun International Airport is 14 miles away. 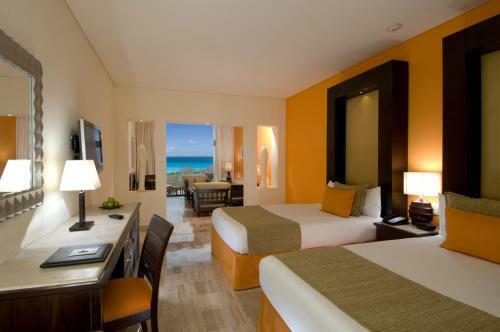 Paradisus Cancun - All Inclusive is an amazing Cancún lodging choice for your trip to Mexico. With numerous amenities for guests such as children's play area, 24 hour front desk, hair dryer, you will wake up at Paradisus Cancun - All Inclusive feeling refreshed every day for your time in Cancún. Don’t let this amazing reservation opportunity pass you by, book your stay at Paradisus Cancun - All Inclusive today to make the most of your time in Cancún, Mexico.